The American Football Conference’s (AFC) South division features the some of the newest teams in the National Football League (NFL). This includes the Houston Texans and the Jacksonville Jaguars, which are both u nder thirty years old. The division is rounded out by the notorious Indianapolis Colts and the ever-ready Tennessee Titans. Find out all you need to know about betting on the teams in the AFC South Division down below, where we have provided brief overviews of their performance in recent years. We also provide a list of the best sports books to place a bet on any NFL team. 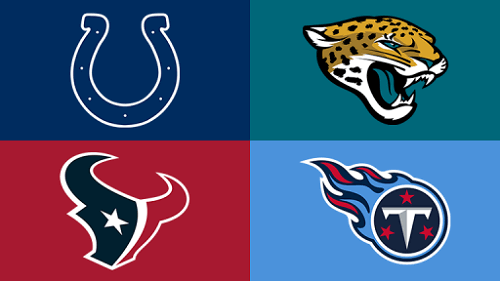 If you’re looking to place a bet on any of the teams in the AFC South, look no further. These are the best sports books for NFL betting. Each is sure to provide USA bettors with amazing odds on the latest sports fixtures. Indianapolis Colts – Andrew Luck had big shoes to fill when he usurped the role of starting quarterback form Peyton Manning in 2012. Under his leadership, the Colts have had some pretty good seasons, but have yet to make it to the conference championship. However, there is a chance that the team may succeed some time in future. Houston Texans – although the Texans have long been viewed as the punching bag in the AFC South, this has changed rather recently. The team has grown to become a real contender in the league this year, which saw a nine-game winning streak. While the 2019 Super Bowl may have evaded them, there is some chance that 2020 may prove to be their year! Tennessee Titans – despite a long history in the NFL, the Titans have underperformed in recent years. Since their 1999 Super Bowl appearance, the team has appeared in the playoffs six times in the last 20 seasons. Although the team did not have a bad year in 2018, they also did not have a great one. Thus, they may have to go back to the drawing board if they really want to have an impact on future seasons. Jacksonville Jaguars – despite making the playoffs in 2017, the Jacksonville Jaguars haven’t really had all that many great seasons in recent years. Their 2018 season proved to be rather unsuccessful despite coming off an AFC Championship game experience the previous year. The team will need to do a lot of work to return to their previous good form. As can be seen with the Jacksonville Jaguars, a team’s form can change from one year to another very quickly. Thus, it is important to keep watching games (including pre-season match ups) to make the informed bets. Overall, if you’re looking to make a future bet based on any of the teams in the AFC South, we’d recommend picking the Indianapolis Colts. Although Luck was out for the 2017 season, he has had a good 2018 season and seems hellbent on at least matching his predecessor’s achievement of winning the Super Bowl.